The Problem: Sin and a Fallen World The Creation and Fall: Genesis How did we get here (in this mess)? 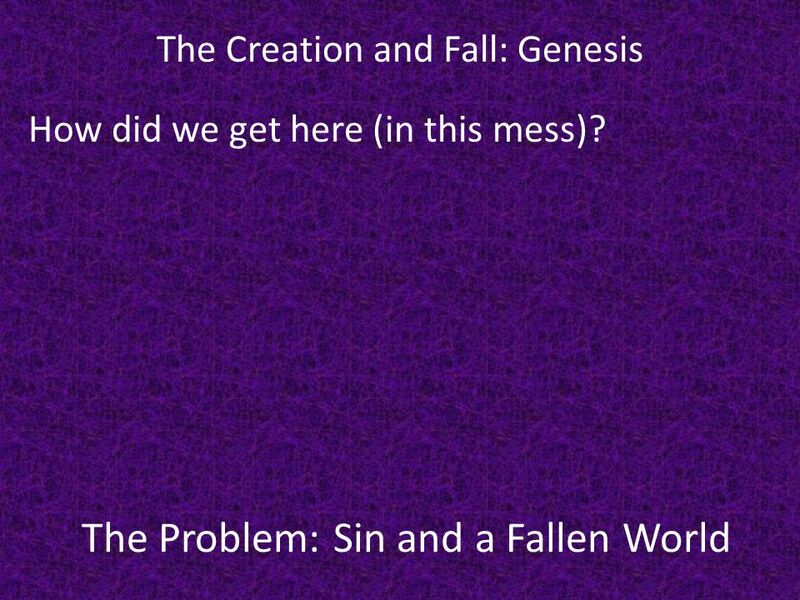 1 The Problem: Sin and a Fallen World The Creation and Fall: Genesis How did we get here (in this mess)? 2 The Problem: Sin and a Fallen World Gen. 1:31: And God saw everything that he had made, and behold, it was very good. How then do you explain the state of the world? 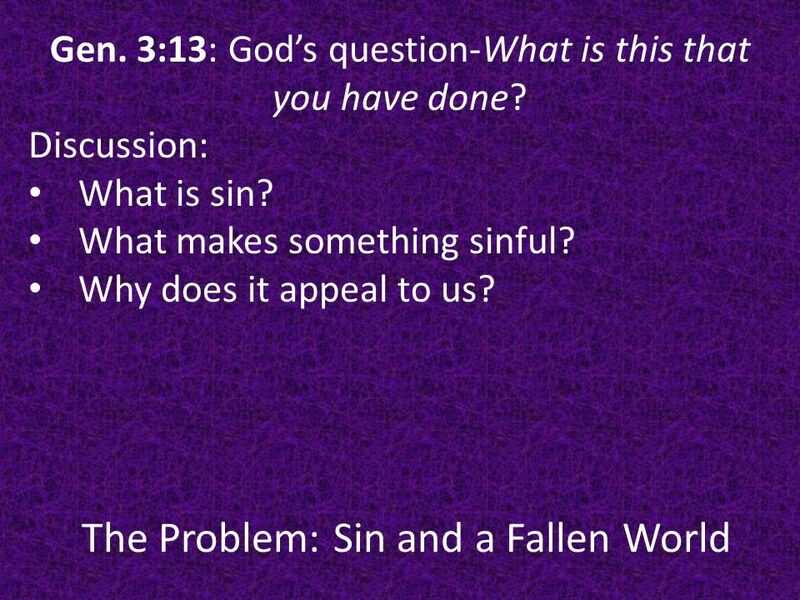 3 The Problem: Sin and a Fallen World Gen. 3:13: God’s question-What is this that you have done? Discussion: What is sin? What makes something sinful? Why does it appeal to us? 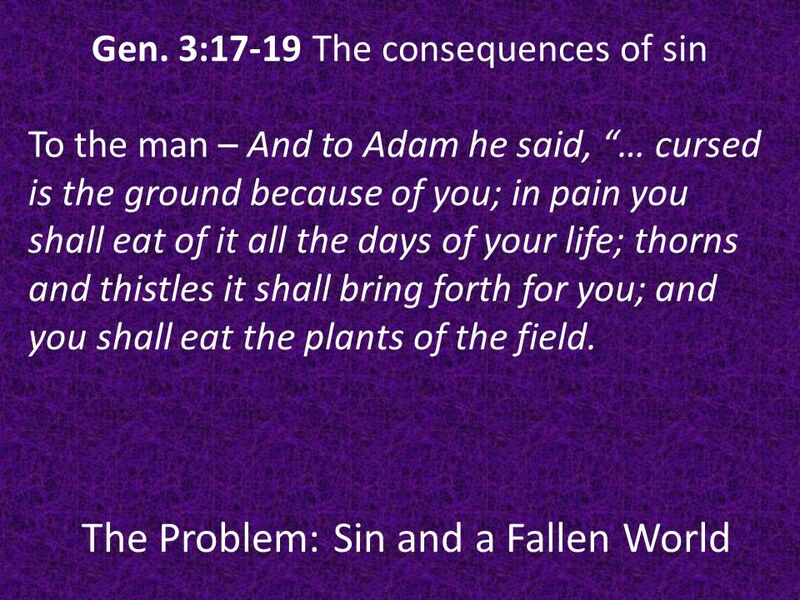 6 The Problem: Sin and a Fallen World Gen. 3:17-19 The consequences of sin To the man – And to Adam he said, “… cursed is the ground because of you; in pain you shall eat of it all the days of your life; thorns and thistles it shall bring forth for you; and you shall eat the plants of the field. 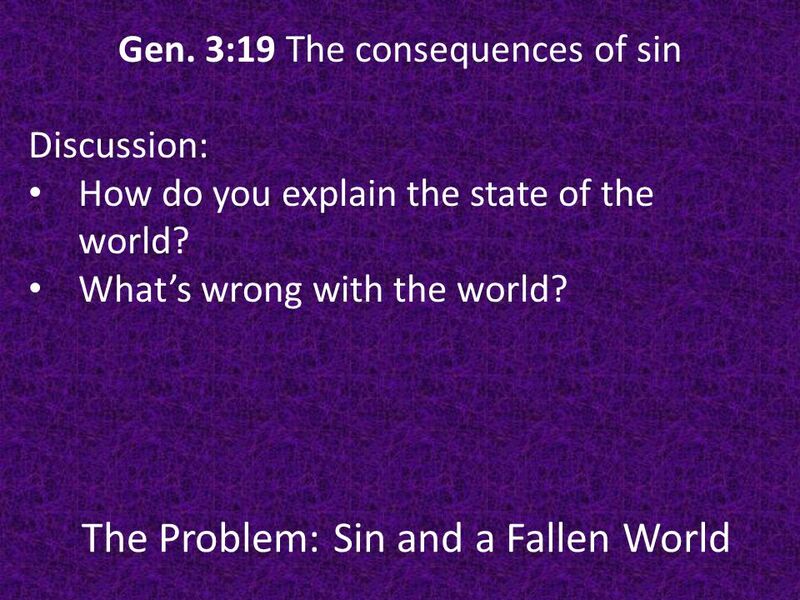 8 The Problem: Sin and a Fallen World Gen. 3:19 The consequences of sin Discussion: How do you explain the state of the world? What’s wrong with the world? 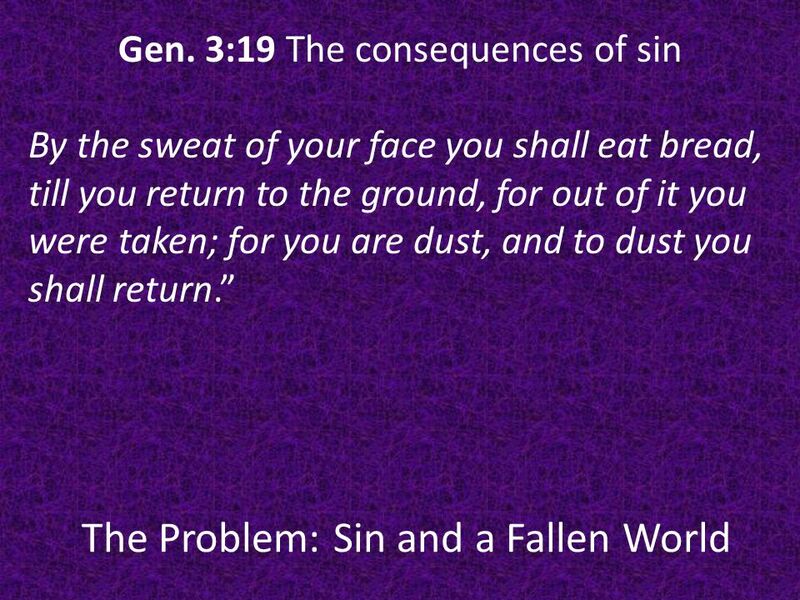 9 The Problem: Sin and a Fallen World Why Sacrifice? 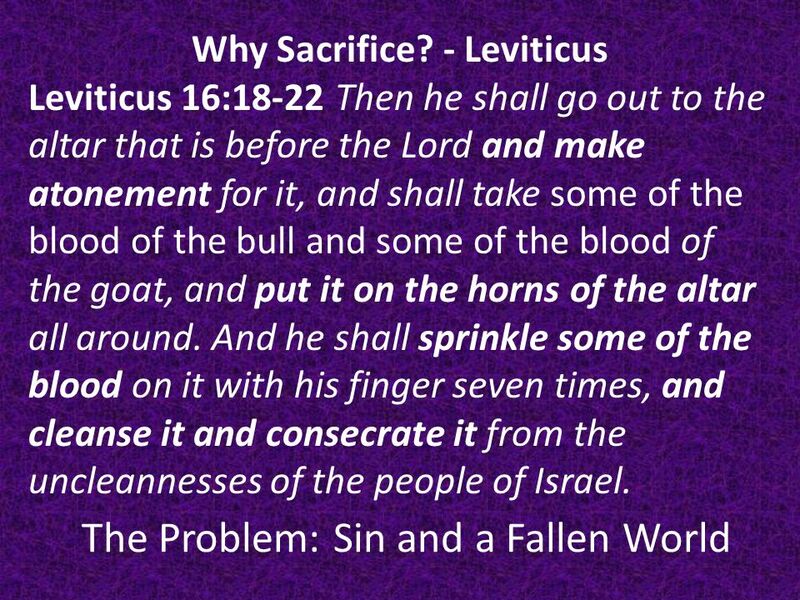 - Leviticus Leviticus 16:18-22 Then he shall go out to the altar that is before the Lord and make atonement for it, and shall take some of the blood of the bull and some of the blood of the goat, and put it on the horns of the altar all around. And he shall sprinkle some of the blood on it with his finger seven times, and cleanse it and consecrate it from the uncleannesses of the people of Israel. 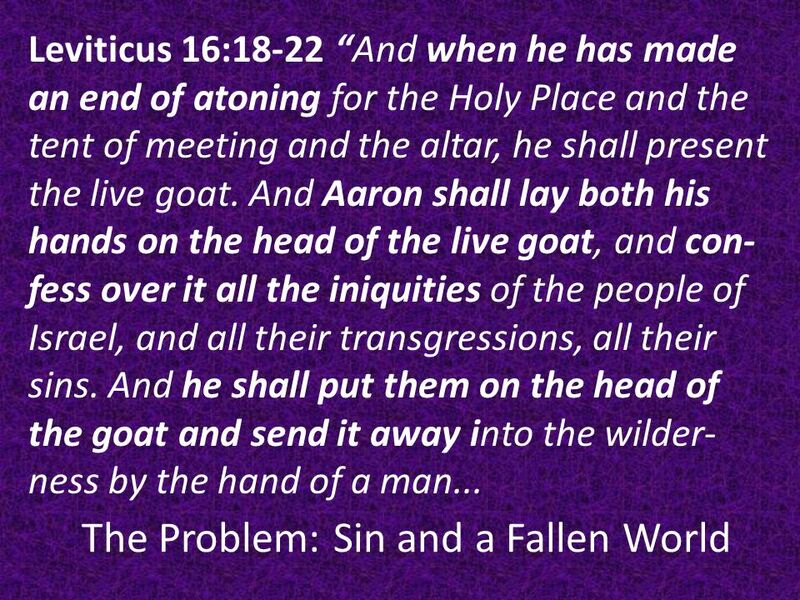 11 The Problem: Sin and a Fallen World Leviticus 16:18-22 “The goat shall bear all their iniquities on itself to a remote area, and he shall let the goat go free in the wilderness. 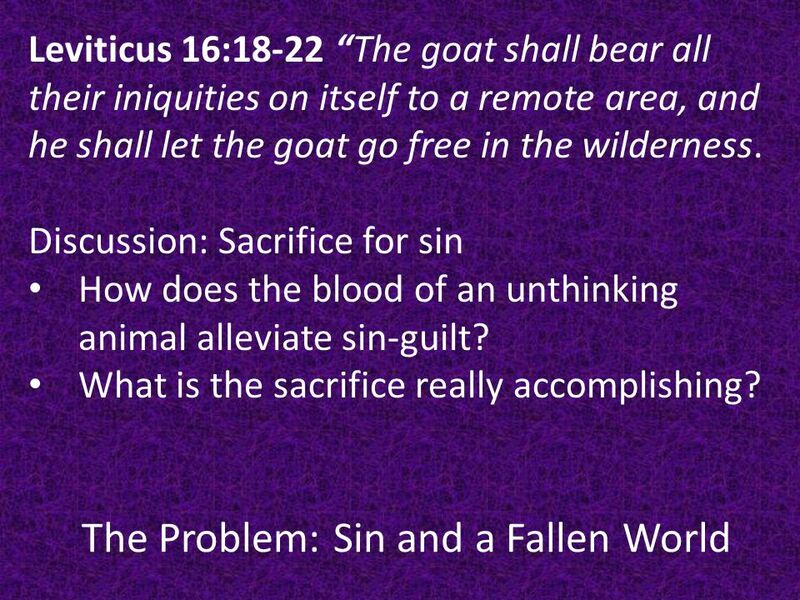 Discussion: Sacrifice for sin How does the blood of an unthinking animal alleviate sin-guilt? What is the sacrifice really accomplishing? 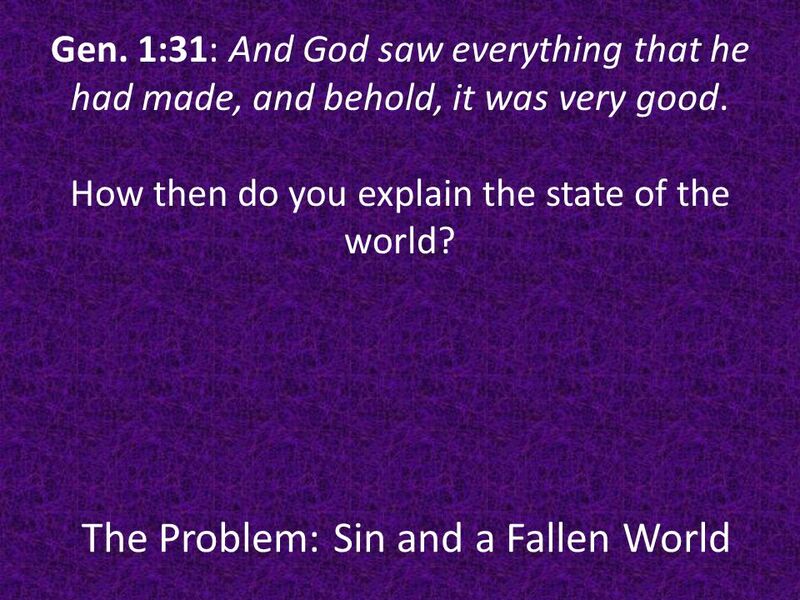 12 The Problem: Sin and a Fallen World How well was it working? 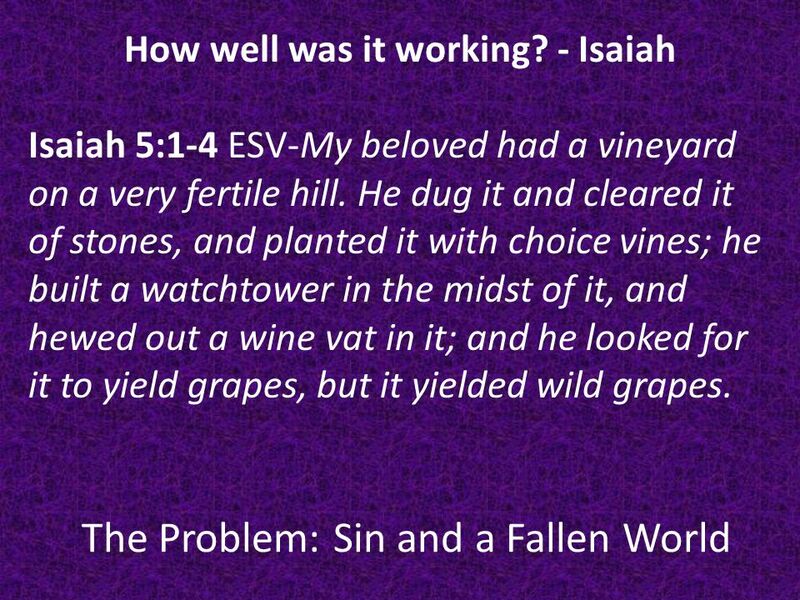 - Isaiah Isaiah 5:1-4 ESV-My beloved had a vineyard on a very fertile hill. He dug it and cleared it of stones, and planted it with choice vines; he built a watchtower in the midst of it, and hewed out a wine vat in it; and he looked for it to yield grapes, but it yielded wild grapes. 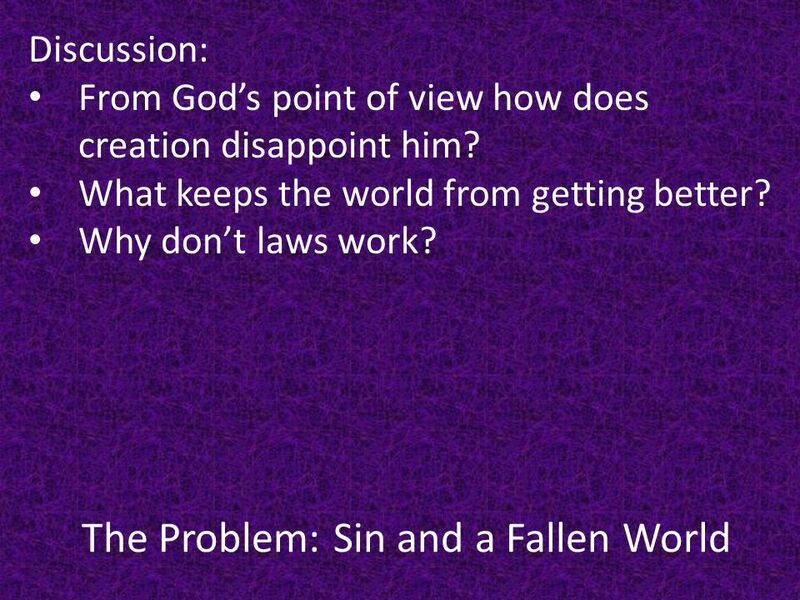 14 The Problem: Sin and a Fallen World Discussion: From God’s point of view how does creation disappoint him? What keeps the world from getting better? Why don’t laws work? 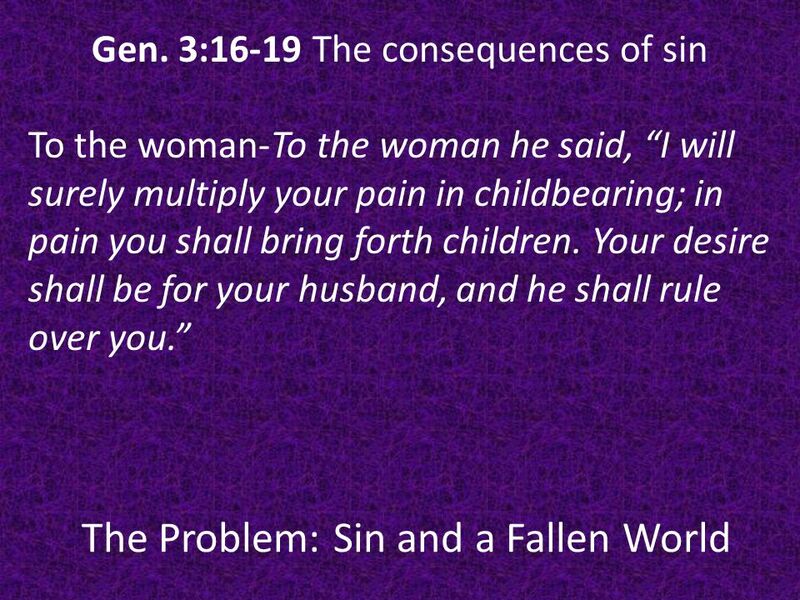 15 The Problem: Sin and a Fallen World What’s this got to do with me? 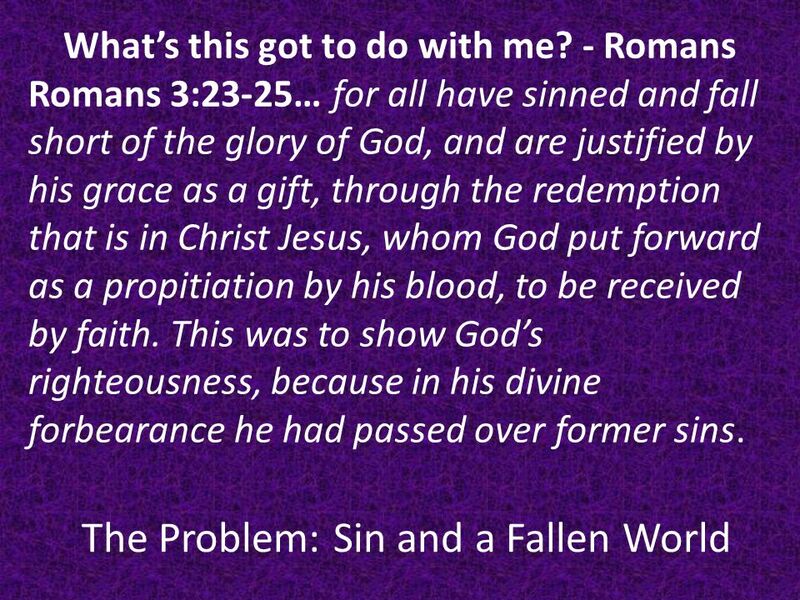 - Romans Romans 3:23-25… for all have sinned and fall short of the glory of God, and are justified by his grace as a gift, through the redemption that is in Christ Jesus, whom God put forward as a propitiation by his blood, to be received by faith. This was to show God’s righteousness, because in his divine forbearance he had passed over former sins. 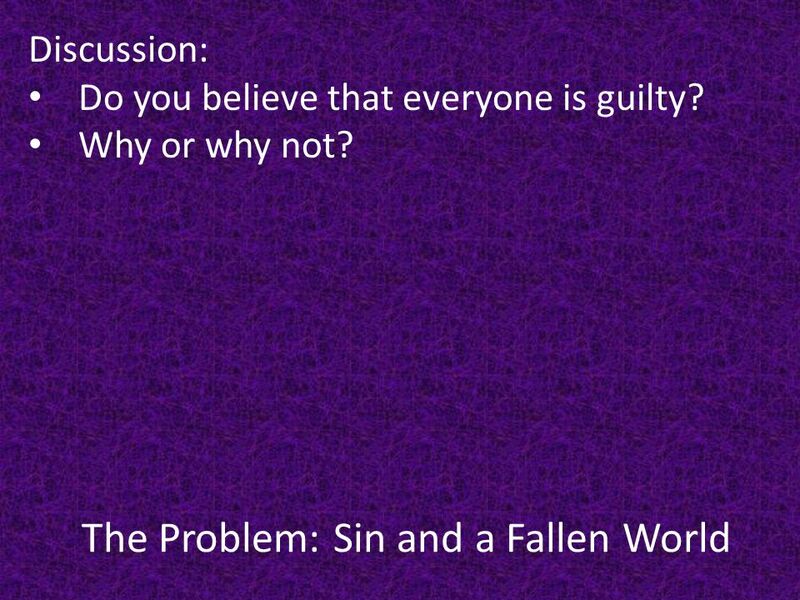 16 The Problem: Sin and a Fallen World Discussion: Do you believe that everyone is guilty? Why or why not? 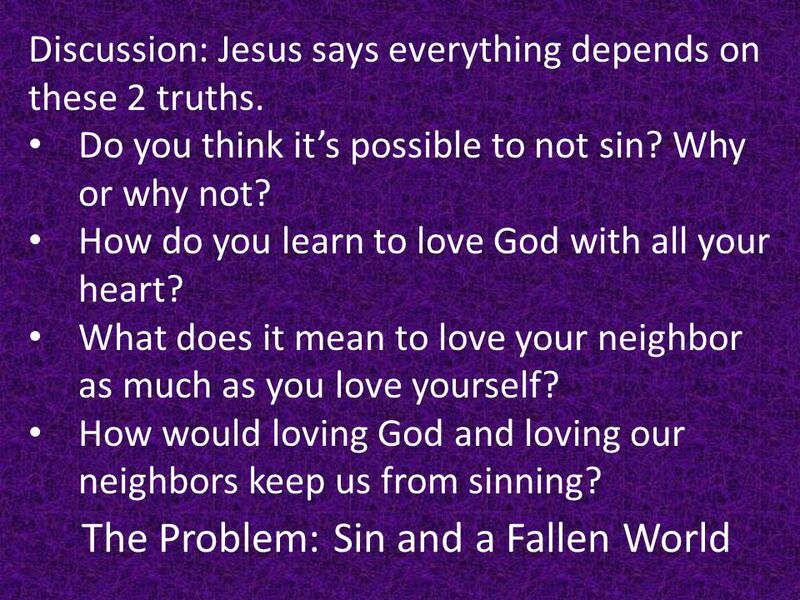 18 The Problem: Sin and a Fallen World Discussion: Jesus says everything depends on these 2 truths. Do you think it’s possible to not sin? Why or why not? How do you learn to love God with all your heart? What does it mean to love your neighbor as much as you love yourself? 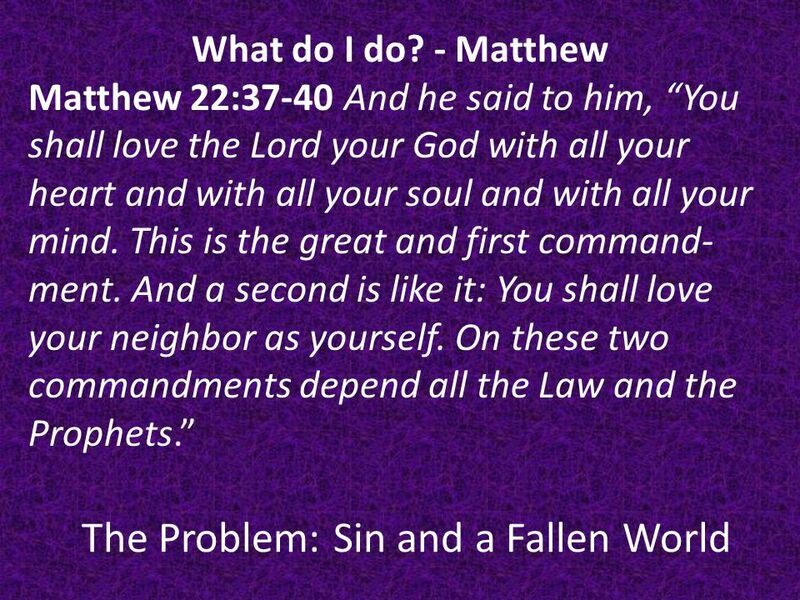 How would loving God and loving our neighbors keep us from sinning? 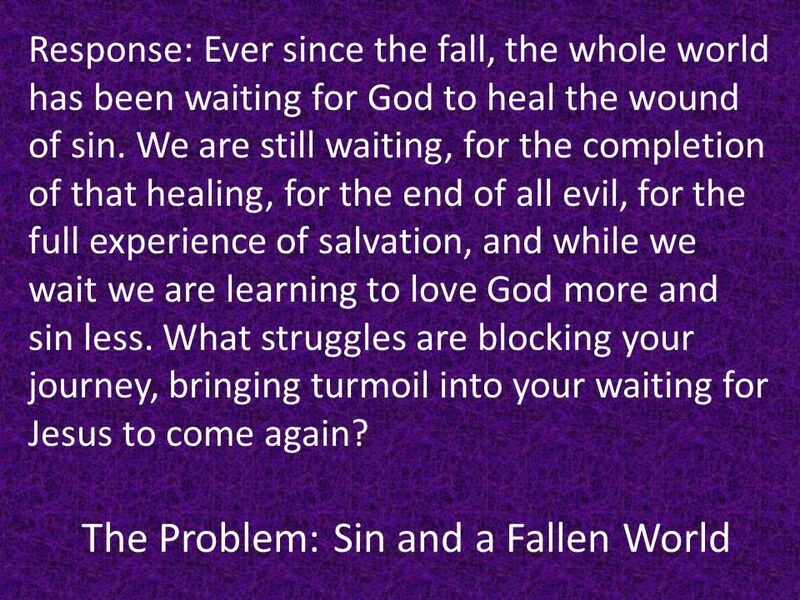 19 The Problem: Sin and a Fallen World Response: Ever since the fall, the whole world has been waiting for God to heal the wound of sin. We are still waiting, for the completion of that healing, for the end of all evil, for the full experience of salvation, and while we wait we are learning to love God more and sin less. What struggles are blocking your journey, bringing turmoil into your waiting for Jesus to come again? 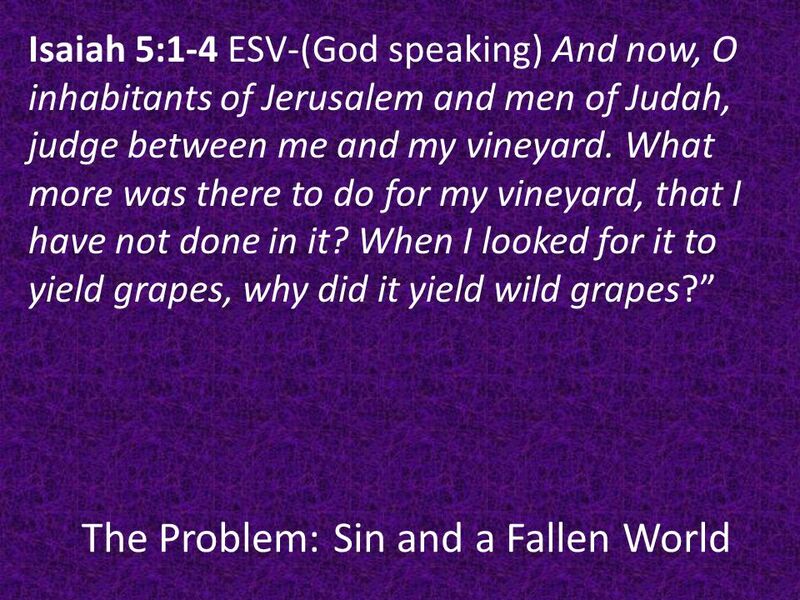 Download ppt "The Problem: Sin and a Fallen World The Creation and Fall: Genesis How did we get here (in this mess)?" God’s Gift of Life! Believing the creation story: All life is God’s doing. BOOKLETS 1.Suggested Donation of $2 for small, $3 for large. 2.Write your name. 3.Join a small group bible study. Why Easter? Those who know me, know that I am: Not convinced that the church celebrates the right days Not convinced we celebrate properly Convinced we. October 29, 2014 AUSTIN STONE INSTITUTE Humanity & Sin II Greg Breazeale. 5. Eph 6:13; Therefore take up the whole armor of God, that you may be able to withstand in the evil day, and having done all, to stand. Eph 6:14; Stand. John 1: John answered them, saying, “I baptize with water, but there stands One among you whom you do not know. 27 It is He who, coming after. WELCOME Sunday 18 th January to Week 2 Bible Club. The Meaning of the Cross An Easter message Easter Sunday, April 12, 2009 Speaker: Phil Hainaut. _Q4_L13. How did people before Jesus understand the Gospel? ADAM “And I will put enmity between you and the woman, and between your seed and. Jesus, Our High Priest Atonement in the Church. Moses Inaugurated the First High Priests And Moses took half the blood and put it in basins, and half. The Fall Part 1 Genesis 3 “The LORD God made garments of skin for Adam and his wife and clothed them.” v.21. GOD AND US Genesis 1-3. WHAT WE LEARNED: 1. Only God Creates 2. Only God is Powerful 3. Only God is Good 4. Only God is Beautiful. HEAVEN Yellow is for. The streets are made of purest gold. Revelation 21:21 It is a place where... There will be no tears, no death, no crying, no pain. Category 2 - D This group of slides has been designed to assist students endeavoring to memorize the scripture passages chosen by The National Bible Bee.